Is this any different from the version that was previously avaliable through your plugin tool, or is this just a reupload of the resource? It looks like a more flexible, user friendly version of the older resource which wasn't a modular. It's **modular**, letting you combine effects in the different screens. Am I missing something? I'm using Pokemon Essentials 17.2, extracted the contents of MTS_files.rar to their appropriate spots, created an entry for the script linked above Main, and uncommented the first preset (Electric Nightmare). Despite all of this, the title screen never appears. No compile-time or run-time errors are thrown and I haven't seen any symptoms to diagnose what even could be going on. I tried installing on a fresh Pokemon Essentials 17.2 and I get the same result. So silly me, I didn't realize you had to open the game outside of RMXP. Although the script ran on a clean Pokemon Essentials, it did not run on my own project. I do not know why this was happening, but migrating into a new project was my solution. I didn't realize you had to open the game outside of RMXP. This has been a QoL feature in Essentials since forever. In order not to waste too much of your time while beta testing, the game jumps straight into the load screen if you're running it from debug (which is triggered when you playtest the project from RMXP). Although the script ran on a clean Pokemon Essentials, it did not run on my own project. I can't guarantee compatibility with anything other than a clean version of Essentials. # title screen filename, also in Titles with no extension. uh, really dumb question, but when I try and run my project, it says I don't have the TitleScreen.rxdata file. how do I get/build one? It's in the download behind the "this pack" link under Instructions. Script 'Main' Line 49: NoMethodError ocurred. What did I do wrong? I pasted the script above main, and put the folders on the pack where they belong. Nah, that's my fault. I forgot to put a sprite function in the main pack that I released. 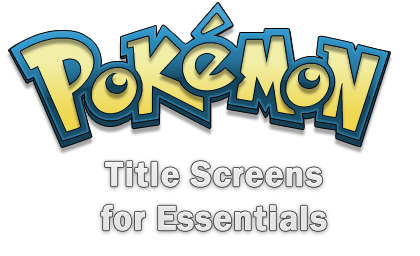 I've fixed up the scripts in the main pack, but you can just download the new TitleScreen.rxdata and put it in your /Data/ folder instead. Your website doesn't seem to have any links. Or, none that I can see. At the top of the post there's a "download" button. please post your "Main" Script and the "Title Screen" Script. Maybe use something like https://pastebin.com/ or directly here.